2What’s the key to reading comprehension? 3Who has better comprehension: students with higher reading test scores or students with more relevant knowledge? 4How important are reading comprehension strategies? 5What’s the key to critical thinking? 6Why memorize facts now that we have Google? 7What happens if children don’t acquire a broad foundation of academic knowledge? 8Do young children really need to study science, history, geography, and the arts? 9How much time are elementary teachers spending on science and social studies? 1/9 What is cognitive science? Cognitive science is a catchall term for the many different fields that study how the mind works. It encompasses psychology, neuroscience, linguistics, computer science that explores artificial intelligence, and more. Practitioners in these fields explore how we speak, reason, remember, and solve problems. In short, cognitive scientists are trying to understand issues related to the most important question of the educational process: how we learn. Over the past fifty years, researchers have made great advances in understanding language development, reading comprehension, critical thinking, and problem solving. We’ve compiled a handful of insights from this body of evidence that can help educators improve classroom practice and policy-makers develop more supportive policies. 2/9 What’s the key to reading comprehension? Reading comprehension is a complex process that can be distilled to two fundamental abilities: sounding out words and understanding those words. The first ability, known as decoding, is a skill that most children master in the first few years of schooling. With systematic instruction, virtually all children — including those learning English — can be fluent decoders within two to three years. The second ability, which is what most people mean by comprehension, is not easily mastered. Understanding depends on the reader’s knowledge and vocabulary, both of which build slowly over many years, inside and outside of school. “The first and most visible consequence of the new entrepreneurial era will be restoring America as a spacefaring nation. Yes, I know we do spectacular robotic explorations. But our ability to toss humans into space disappeared when NASA retired the space shuttle — without a replacement. This is not a technical paper; it’s an opinion piece aimed at a very broad audience, but it assumes that readers have a massive amount of relevant knowledge. None of the key terms is defined. Readers are supposed to know entrepreneurial era, spacefaring, NASA, space shuttle, etc. They also have to fill in missing information: What’s wrong with using 1960s technology? Why would we care that it belongs to Russia? Assuming the reader has a great deal of knowledge is inevitable. Just imagine how long—and boring—the op-ed would be if every term were defined. Every time we communicate, we have to make guesses as to what information we need to provide and what we can assume. If, for example, your preschooler asks “Why is the sky blue?” you’d give a very different answer than if your physics professor asked. In terms of comprehension ability, getting from preschooler to professor requires learning a massive amount of knowledge — and the vocabulary that represents that knowledge. 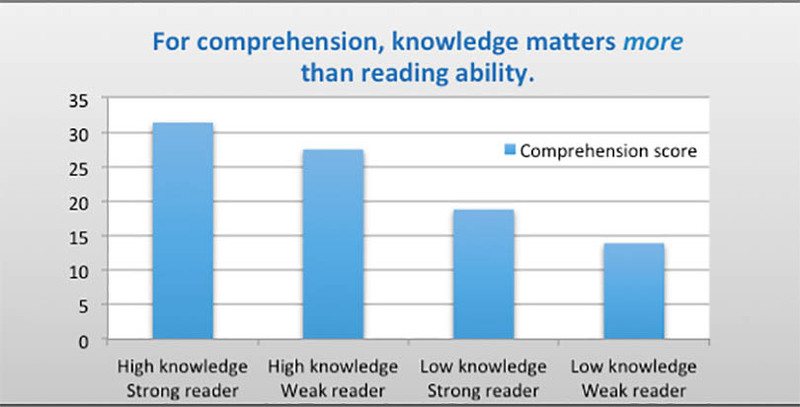 3/9 Who has better comprehension: students with higher reading test scores or students with more relevant knowledge? Here’s a quick summary of an iconic study (which has been affirmed many times): researchers took a group of junior high students and gave them two tests — one was a standard reading comprehension test, the other assessed their knowledge of baseball. Researchers were then able to break the students into groups: high or low reading ability, and high or low knowledge of baseball. The students were then given a passage describing part of a baseball game. They were asked to retell what happened and, using a model of the field and players, show what happened. As expected, the students who scored high in reading and baseball performed the best, and those who scored low in both did the worst. But what about those two groups in the middle? Did the strong readers without much knowledge of baseball outperform the weak readers who knew a lot about baseball? No. The more knowledgeable students outperformed the stronger readers. In fact, they performed almost as well as the students who were both knowledgeable and strong readers. 4/9 How important are reading comprehension strategies? Comprehension strategies are useful, but they are not essential to reading in the way fluent decoding and broad knowledge are. Comprehension strategies offer students multiple ways of interacting with the text. Common strategies include finding the main idea, summarizing, and asking and answering questions. Studies have found that using such strategies improves students’ comprehension but cognitive scientists are still investigating how different strategies work. As Nonie Lesaux, a researcher at Harvard, has noted, “Comprehension strategies often taught as part of today’s standard instruction — predicting, summarizing, making inferences — can be leveraged only if the student has the relevant vocabulary and background knowledge needed for the passage.” In other words, the strategy itself isn’t creating the understanding. If the reader does not have enough relevant knowledge, such strategies can’t even be used. Comprehension strategies appear to be most useful in the upper elementary grades as children transition from practicing decoding skills to reading for pleasure and acquiring new information. Throughout the elementary years, the best way to build comprehension is to focus on increasing students’ subject-matter knowledge and vocabulary. Fortunately, comprehension strategy instruction need not take more than a handful of lessons. 5/9 What’s the key to critical thinking? Much like reading comprehension, the key to critical thinking is knowledge. But while broad knowledge is essential to being a good reader, deep knowledge is needed for critical thinking. Consider the difference between reading a newspaper and a technical journal article. The newspaper’s various articles will assume the reader has basic knowledge of dozens, perhaps hundreds, of different topics. The journal article will be focused on one topic, but will assume the reader has expert-level knowledge (otherwise the journal would be useless to actual experts). It’s the difference between WebMD and the Journal of the American Medical Association. 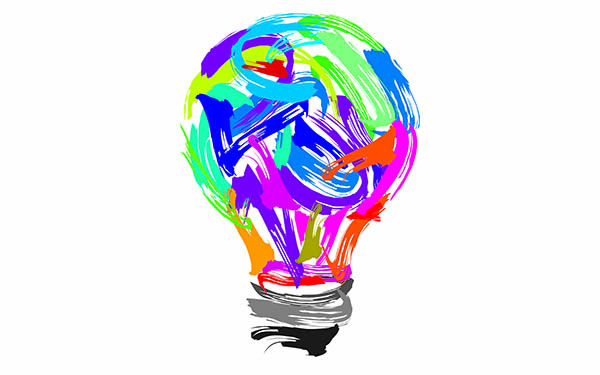 The idea that critical thinking requires extensive knowledge should be fairly obvious. Pick a topic you know a good deal about, perhaps the American Revolution. Now think critically about its causes: taxation, lodging for British soldiers, a growing sense of independence, etc. Easy. Let’s switch to a topic you know very little about, perhaps black holes in outer space. Now think critically about their causes. Not so easy. You’re not lacking the ability to think critically; you’re lacking deep knowledge of the topic. The implications for education are clear: if we want students to think like scientists or historians, we have to teach them the academic content that scientists and historians know. As with reading comprehension strategies, tips like “scientists use unexpected results to form hypotheses” or “historians consider the source when interpreting a text” can be helpful reminders — but they can’t be acted upon without the relevant, domain-specific knowledge. 6/9 Why memorize facts now that we have Google? We’ve established that knowledge is important, but does it really have to be in your head? Can’t it just be at your fingertips? In a word, no. For an engaging discussion of the cognitive science as to why a substantial foundation of academic knowledge must be lodged in memory, see Daniel Willingham’s Why Don’t Students Like School? Here, we’ll address the issue as a practical matter by considering what a challenge reading is when key terms and concepts are not known. Consider robotic explorations. For educated adults, these two words conjure up a wide range of information, from the Mars rover to Star Wars. The same is true of NASA, the space shuttle, Russia, and the 1960s. But imagine if those terms meant nothing to you. Looking each one up would turn a quick skim of the newspaper into an hour-long research project. Not only are you unlikely to invest that level of effort, even if you do Google all the unfamiliar terms, you probably won’t be able to develop a solid understanding of the op-ed. First, just like with the original op-ed, you’ll likely struggle to understand the information Google returns. Second, even if you find sufficiently basic explanations, you’ll struggle to assimilate all this new information at once and harness it to grasp the op-ed. Third, since you don’t know much about the topic, you will have to assume information you dig up and comprehend is accurate; you’ll have a hard time analyzing the veracity of your sources. The bottom line is that Google is a great tool for learning, but it’s not a substitute for learning. 7/9 What happens if children don’t acquire a broad foundation of academic knowledge? When children don’t build broad knowledge, their reading comprehension and critical thinking ability suffer. Among older middle and high school students, knowledge levels vary enormously by domain and thus so do comprehension and critical thinking abilities. Many students have enough broad, surface-level knowledge to comprehend a passage on a basic level, but not deep enough knowledge to think critically about it. This was the case in an illuminating study of seventh graders. To explore students’ ability to analyze new information (particularly online), researchers had them evaluate the credibility of a website about the Pacific Northwest Tree Octopus. Yes, an octopus that apparently lives in a tree — a pine tree. The site had all the usual information about eating, mating, etc. The students read it with understanding, dutifully applied the critical thinking strategies they had been taught, and decided the site was trustworthy. No one was suspicious, even though the sasquatch was mentioned as a predator. The researchers concluded that the students need more instruction in media literacy — i.e., more strategies. In fact, this study may reveal just the opposite: students need more knowledge. Basic information about marine life dismisses any possibility of an octopus living in a tree, no matter how plausibly the information is presented or how expertly the images are Photoshopped. 8/9 Do young children really need to study science, history, geography, and the arts? Yes. Knowledge and vocabulary grow exponentially inside and outside of school. The longer schools wait to immerse children in knowledge-building subject matter, the more difficult it is to close the gaps. While no elementary schools truly eschew building children’s knowledge, academics often do take a backseat to developing basic reading skills. The popular concept of “learning to read and then reading to learn” subtly reinforces the notion that science and social studies can wait. 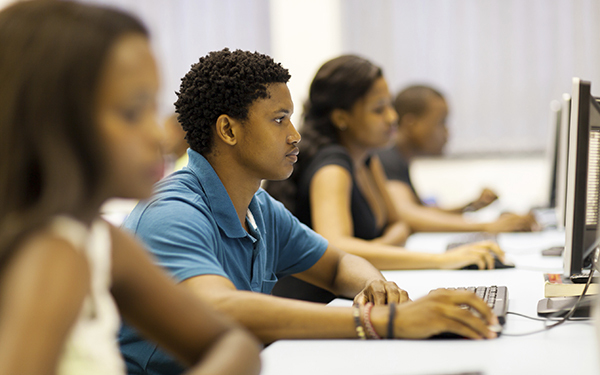 No program aims to increase achievement gaps, but that may be the result. Take vocabulary growth, for example. Researchers estimate that college-ready teens know about 60,000 to 100,000 words. That’s far too many to have learned through traditional vocabulary instruction. Most words are learned indirectly, bit by bit, through multiple exposures in multiple contexts. The larger the child’s vocabulary, the more contexts she understands, and the more her vocabulary grows. When children are young, much of that learning is through listening and asking questions. Later on, most of it is through reading, especially since written texts use far more academic vocabulary than spoken language. Either way, the growth is exponential. But exponential growth does not mean that all children are learning at the same rate. Children with well-educated parents tend to have far more opportunities to learn, and far steeper growth curves for knowledge and vocabulary. Reading researcher Keith Stanovich dubbed this the Matthew effect, referring to the Biblical passage about the rich growing richer. The more knowledge children have, the faster — the more virtuous — that cycle is. And the less knowledge children bring with them to school, the more their teachers should focus on building it as early and as quickly as possible. 9/9 How much time are elementary teachers spending on science and social studies? This is not to say that reading tests are not valuable. But the use of test-based accountability, most prominently via No Child Left Behind, has been much less successful in reading than in math. Research has generally found that holding schools accountable for test scores leads to improvements in student learning in math — but not always in English. This suggests that focusing on reading test scores for accountability purposes may not be successful if teachers respond by reducing the very content students need to succeed on reading exams. With ESSA, states now have the flexibility to rethink their accountability plans. To improve reading comprehension and critical thinking, they should incentivize districts and schools to patiently invest in building students’ knowledge.